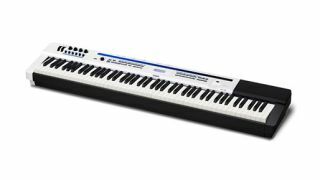 Casio's PX-5S is both stage piano and synth. NAMM 2013: It turns out that "the most powerful synth that Casio has ever built" that was teased prior to NAMM is actually a stage piano that also boasts significant synthesis capabilities. Also useable as a MIDI controller, this 88-note keyboard comes with 340 presets, an arpeggiator, a phrase sequencer, effects and more. Find out more below or on the Casio website. Word has it that the PX-5S will be available soon for around $1,000.